Suillus sibiricus ectomycorrhizae on inoculated Pinus albicaulis seedling in the nursery. Suillus ectomycorrhiza on naturally establishing Pinus albicaulis seedling in the field. Based on the article by permission of the author: Cripps, C. 2001. Mycorrhiza. in Maloy, O. C. and Murray, T. D. 2001. Encyclopedia of Plant Pathology. Vol II. John Wiley & Sons, Inc.
A mycorrhiza is a mutualistic symbiosis between a fungus and the roots of a plant. 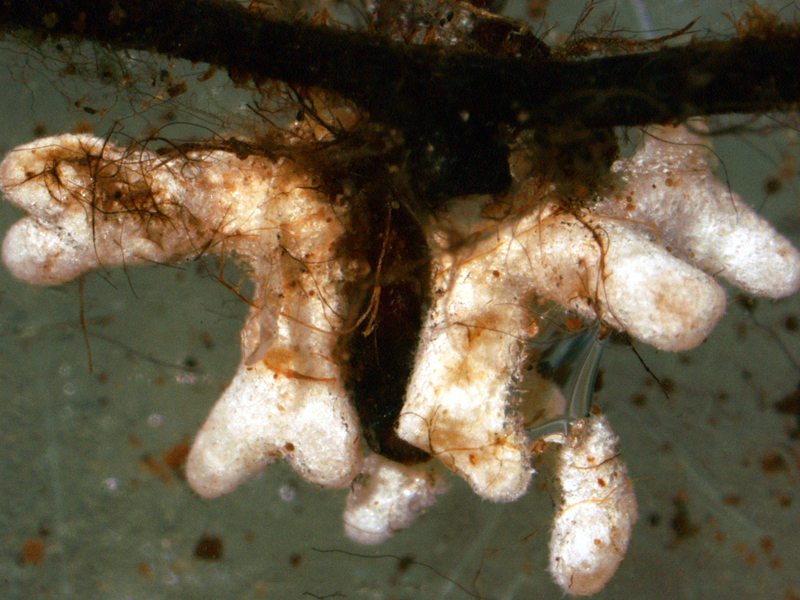 This interaction results in recognizable fungal structures on or within roots. Mycorrhizal fungi gain carbohydrates (simple sugars) from plant roots, and enhance plant uptake of inorganic nutrients, particularly phosphorus and nitrogen. The relationship is considered non-pathogenic, and of benefit to the plants involved. The mycorrhizal condition is the normal state of over 85% of plants in nature. Thousands of fungal species and most plants form mycorrhizae. The relationship is not generic, and there are many plant-fungus combinations, each with its own unique properties. The establishment, growth, and health of plants is enhanced by mycorrhizal formation under most conditions. In addition to increasing uptake of inorganic nutrients (NPK) and water, mycorrhizae can provide plants with protection against drought, high soil temperatures, acidity, heavy metals, some pathogens, nematodes, insects, and other soil organisms. Beneficial properties of mycorrhizae have been exploited for applications in agriculture, forestry, horticulture, reclamation and biocontrol. The term mycorrhiza literally means “fungus-root” and was coined in 1885 by A. B. Frank who was commissioned by the King of Prussia to discover if truffle production could be increased.3 He never succeeded in the task, but described root structures on trees closely associated with truffles, and was the first to distinguish ectotrophic and endotrophic mycorrhizae. The terms ectotrophic and endotrophic mycorrhiza were replaced by ‘ectomycorrhiza’ and ‘endomycorrhiza’ in the 1960’s. Endomycorrhiza implies the presence of intracellular hyphae, and has become an ambiguous term, since several unrelated types were discovered. The term is used inconsistently in the literature, and can refer to several unrelated types with internal hyphae as a group (arbutoid, ericoid, orchid, monotropoid, vesicular-arbuscular, and ectendomycorrhizae), or alternately, as a synonym for only the most common type, vesicular-arbuscular mycorrhizae. Ectomycorrhizae differ from the other types by an absence of hyphae, which invade root cells of host plants. It is more informative to use one of seven specific categories when describing mycorrhizal types including ectomycorrhizae, vesicular-arbuscular mycorrhizae, ericoid, arbutoid, monotropoid, orchid, and ectendomycorrhizae. Globally, the two most common types of mycorrhizae are vesicular-arbuscular mycorrhizae found on over 70% of all plants, and the ectomycorrhizal type common on woody plants such as trees, particularly conifers of the extensive boreal forests. A vesicular-arbuscular mycorrhiza (VA mycorrhiza or VAM) is a mutualism between plants and certain fungi in the Zygomycota which form distinct structures (arbuscules and vesicles) within plant roots. More recently these fungi have been termed AM fungi, because many do not form vesicles. The term AM fungi is used in the newer literature, but equates with VAM or VA fungi used in older articles. The hyphae of the fungus penetrate root cell walls, invaginate the root cell membrane, and proliferate into finely branched structures called arbuscules. Arbuscules absorb carbohydrates from the plant. Phosphorus from the soil is transferred via the mycelium and arbuscules to root cells, enhancing plant uptake.12 Some fungi also form vesicles, which are elliptical hyphal swellings filled with lipids and storage products. 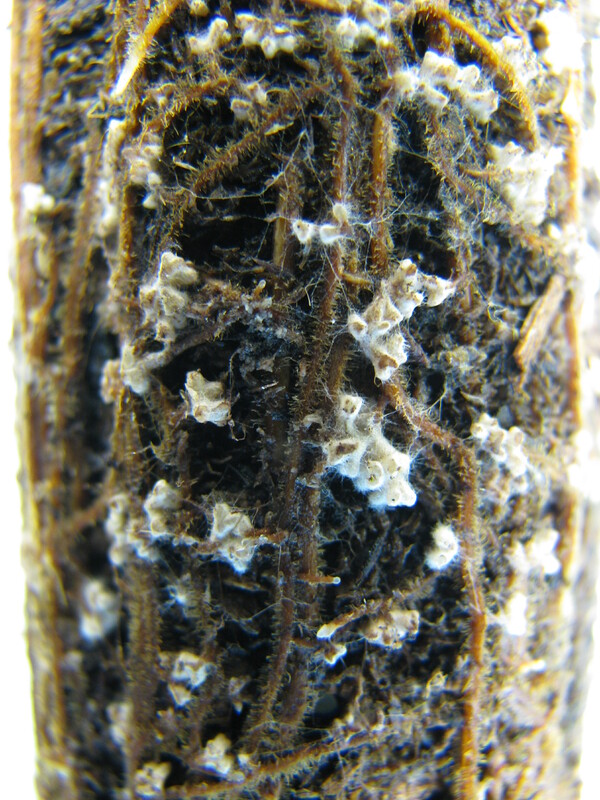 Hyphae are non-septate, as is characteristic of zygomycetes, and often appear kinked. Reproduction is asexual by chlamydospores or azygospores attached directly to the hyphae. The 149 species of fungi involved with VAM are classified in Glomales (Zygomycota), and were previously lumped in the Endogonaceae. This is the most widespread type of mycorrhiza, found in over 70% of all plants, and dominates in grasslands, tropics, deserts, and understory plants. An ectotrophic mycorrhiza is a mutualism between fungi and plants in which fungal hyphae do not invade root cells. “Ecto” refers to the fact that hyphae remain intercellular, and do not penetrate root cell walls. Hyphae cover the root forming a mantle (sheath) and surround individual root cells forming a Hartig net. The Hartig net is the site of bidirectional nutrient exchange. Carbohydrates (simple sugars) are transferred from plant to fungus, and in return, fungi enhance the uptake of inorganic nutrients to plants.4 12 The plants involved are primarily woody shrubs and trees, particularly in the pine, willow, birch, eucalyptus, and oak families. The relationship of orchids and fungi is complex, and appears to be a finely balanced symbiosis, which can border on parasitism by plant or fungus. All of the 16,000, or more, species of orchids, green and achlorophyllous, have an obligate dependency on fungi in nature. One set of fungi is important in seed germination and early development, while other fungi establish in adult plants. Orchid seeds are tiny with a limited nutrient supply, and young plants go through a stage where they cannot photosynthesize. Infection by a compatible fungus is necessary to supply needed carbohydrates. In contrast to other mycorrhizal types, carbohydrates flow from fungus to young orchids, which digest the hyphae as infection occurs. Adult orchids usually have mycorrhizal roots although this changes seasonally and infection can be sporadic. Achlorophyllous species continue to gain carbon from fungi, but the relationship is less clear for green orchids. In these orchids, fungi are likely to supply only inorganic nutrients similar to other types of mycorrhizae. In a mycorrhizal relationship, a bidirectional nutrient exchange occurs between a fungus and a plant resulting in benefits to each. In general, fungi absorb minerals from the soil, and transfer them to plants, facilitating an increase in nutrient uptake, while gaining sugars from the plant. As much as 20% of the sugar produced by plants goes to the fungal partner. In the reverse direction, inorganic phosphates in the soil are absorbed by fungi, and transferred to plant roots. Phosphorus, required by plants, is often limiting in soils because it is immobile. In some cases, addition of mycorrhizal fungi produces a dramatic plant growth response. However, results vary with the strain of fungus, variety of plant, and environmental factors such as soil fertility, light, temperature, pH, moisture, aeration, and climate. In general, mycorrhizal fungi improve plant growth more in low nutrient soils, especially with limiting phosphorus. As more fertilizer is added, mycorrhizal infection generally declines. As fungal infection decreases the concentration of phosphorus in plant tissues also decreases.12 Additional benefits to plants, besides improved nutrition, include protection against drought, high soil temperatures, acidity, heavy metals, high arsenic, pathogens, nematodes, invertebrate grazers, and mineral deficiencies. The promise of improved plant growth with mycorrhizal fungi has inspired practical application in forestry, horticulture, agriculture, and reclamation. Inoculation of exotic trees in the 1950’s resulted in stunning plant responses. In the Caribbean, imported pines inoculated with ectomycorrhizal fungi were 8 feet high compared to 12 inches for uninoculated controls after 3 years.13 In the 1970’s, Pisolithus tinctorius was used to inoculate trees for reclamation of coal spoils with some success, and led to commercialization of the fungus.7 Inoculation methods for ectomycorrhizal fungi on trees include soil transfer, vegetative mycelium, spore slurries, and pellets.9 For VA fungi, nurse plants, spore slurries, processed roots, and soil transfers are used for mycorrhization of herbaceous plants. Commercial inoculum is at present expensive, difficult to use on a large scale, and does not produce reliable results. While early successes fueled promotion of mycorrhizae as a natural fertilizer, subsequent field results have been unpredictable or unsustainable. Contributing factors appear to be specificity of fungi, plants, and edaphic factors, resulting in site-specific responses. Enhanced plant growth from improved nutrient acquisition was initially considered the primary beneficial response. Now the importance of more wide ranging effects of mycorrhizae has become apparent. This includes maintenance of soil structure and biota, nutrient recycling, disease suppression, improved water relations, providing biological links, replacement of chemical inputs, increased nutrition from unavailable sources, salt and heavy metal tolerance, and generally moving towards system health and sustainability. The amount of mycorrhization and plant growth response is no longer considered the ultimate measure of potential benefits. Recent trends have focused on providing conditions conducive to mycorrhizal colonization, rather than relying on direct inoculation with mycorrhizal fungi. VAM has potential in agriculture, and has proven beneficial to asparagus, onions, potatoes, citrus, fruit trees, and maple. Cultural practices, which help maintain mycorrhizal fungi, include proper crop rotation, minimum tillage, and use of cover crops. Detrimental practices include flooding, burning, chemical fertilizers (manure is preferable), liming, systemic fungicides, and fallow fields.5 The use of VA in agriculture is of increasing interest in developing countries where fertilizer costs are prohibitive, the use of marginal lands is necessary, and sustainability is required. Use of ectomycorrhizal fungi in forestry has continued and focused on inoculum development, inoculation techniques, potential of native species, specificity of symbiosis, and influences on field response. In the nursery, appropriate conditions include proper soil (coarse), good drainage, adequate aeration, pH below 6, minimal fertilization, low lime, and consideration of the effects of fungicides, and other chemical applications. Selection of the proper fungal species or strains, and quality control is of utmost importance. One of the most effective applications of VA and ectomycorrhizae, has been in land reclamation.8 Inoculated nursery plants or field application of roots and soil containing inoculum have met with some success on disturbed and degraded areas. There is increasing interest in identifying current practices that stall succession. One of these practices is the use and persistence of plants less dependent on mycorrhizae. This can maintain low inoculum levels, and keep more obligate plants of later seral stages at a competitive disadvantage. Sewage sludge amendments and soil compaction by equipment are at odds with mycorrhization. Addition of peat, and appropriate topsoil and stockpiling methods improves conditions for symbiosis. Local inoculum sources and environmental heterogeneity promote soil biota, including mycorrhizal fungi. Use of native fungi, metal tolerant strains, and fungal mixtures also hold promise. The use of mycorrhizal fungi for biocontrol of plant pathogens is relatively new. There is evidence that VAM are effective in suppression of root disease, particularly those caused by nemetodes, fungi and bacteria.6 Paxillus involutus provides some protection against Fusarium root rot in red pine, and other ectomycorrhizal fungi produce antimicrobial compounds. 1 Allen, M.F. 1991. The Ecology of Mycorrhizae. Cambridge, MA: Cambridge University Press. 2 Castellano, M.A. 1994. Current status of outplanting studies using ectomycorrhiza-inoculated forest trees. p. 261–281 in Mycorrhizae and plant health, F. Pfleger, and R. Linderman (eds.). St. Paul, MN: APS Press. 3 Frank, B. Berichte der Deutschen Botanische Gesellschaft 3, 128-145 (1885). 4 Hackskylo, E. 1973. p. 207–230 in Ectomycorrhizae: their Ecology and Physiology, G. Marks, and T. Kozlowski (eds.). New York: Academic Press. 5 Kurle, J., and Pfleger, F. 1994. The effects of cultural practices and pesticides on VAM fungi. p. 101–131 in Mycorrhizae and plant health, F. Pfleger, and R. Linderman (eds). St. Paul, MN: APS Press. 7 Marx, D., and Altman, J. Reclam. Rev. 2, 23–37 (1979). 8 Miller, R., and Jastrow, J. 1992. The application of VA mycorrhizae to ecosystem restoration and reclamation. p. 438–467 in Mycorrhizal Functioning: an Integrative Plant-Fungal Process, M.F. Allen (ed.). New York: Chapman and Hall. 9 Molina, R., and J. Palmer, J. 1982. Isolation, maintenance, and pure cultural manipulation of ectomycorrhizal fungi. p. 115–129 in Methods and Principles of Mycorrhizal Research, N.C. Schenck (ed.). St. Paul, MN: APS Press. 11 Molina, R., O’Dell, T., Luoma, D., Amaranthus, M., Castellano, M., and Russell, K. PNW Research Station, PNW-GTR-309 (1993). 12 Smith, S., and Read., D. 1997. Mycorrhizal Symbiosis, 2nd ed. San Diego, CA: Academic Press. 13 Vozzo, J., and Hacskaylo, E. For. Sci 17, 239-245 (1971).